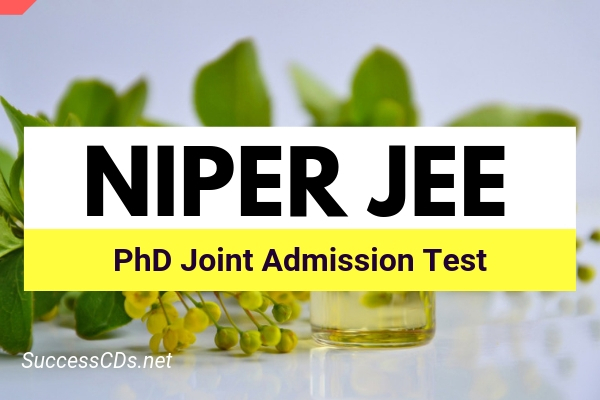 Interested candidates can check all the details of Joint Entrance Exam (JEE) PhD Admission 2019 like application form, eligibility criteria, counselling procedure etc from this page give below. The National Institute of Pharmaceutical Education and Research (NIPER) at S.A.S. Nagar (Mohali) was created as a centre of excellence in imparting higher education, research and development in pharmaceutical sciences and is the first Institute of its kind in the country. Institute is awarding degrees like PhD. ; MPharm. ; MTech. (Pharm. ); M.S.(Pharm.) and M.B.A. (Pharm.) as mandated to it by Section 7 (ii), (iii) and Section 32 of the NIPER Act 1998. The seats available in various NIPERs/departments/disciplines include Institute funded and Government project funded fellowships. Details of seats will be displayed on website www.niperahm.ac.in separately. Applicants shall register online on www.niperahm.ac.in as per instructions given on the website. The process of online registration shall commence on 01st April 2019 onwards and will continue till 15th May 2019, 05.00 PM. Instruction for Registration is available on www.niperahm.ac.in website. Instruction for Registration is available on the website. Open the link of Registration/Login for NIPER Joint Entrance Examination 2019. Take Printout of the Registration form , put signatures at the bottom of the registration form and attach the following (i) copy of award letter if any pertaining to NET‐JRF of CSIR/DBT/UGC/ICMR, DST Inspire etc. (ii) Sponsorship certificate from Industry / Govt. sponsored candidates (as per format given at Annexure‐2 ) should be sent to Chairman, NIPER Joint Entrance Exam PhD, National Institute of Pharmaceutical Education and Research, (NIPER), Sector 67, S.A.S. Nagar (Mohali), Punjab-160062, (through speed post/registered post/in person) so as to reach before the schedule date. Selection of candidates will be done on the basis of their performance in the NIPER Joint Entrance Exam 2019 (NIPER JEE) organized by the Institute. The duration of the entrance test will be of 2 hours. Online test will be held on Sunday, the 09th June 2019 at Ahmedabad, Surat, Rajkot, Bengaluru, Bhopal, Chennai, Chandigarh, Dehradun, Guwahati, Hyderabad, Jaipur, Kolkata, Lucknow, Mumbai, Nagpur, New Delhi, Thiruvananthapuram, Pune, Agra, Vijayawada, Coimbatore, Patna, Ranchi, Raipur and Bhubaneshwar.